Audra Jennings: One Family. One Purpose. One Passion. 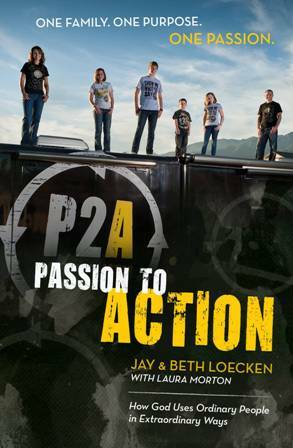 In Passion to Action: How God Uses Ordinary People in Extraordinary Ways, the Loeckens share the remarkable story of how they rediscovered another dream and how it turned their life upside down and fulfilled them more than they ever thought possible. It will inspire readers to discover their own passions and put them into action. “Being in Africa gave us a true and new understanding of what it means to have a sense of community. The people we met and mingled with for those two weeks really rely on one another. They work together and share everything and don’t just think about themselves. They instinctively put others first,” says Jay. Upon returning home, the family realized that they had abandoned their dreams, so they made a u-turn, deciding to recreate what they had found on the other side of the world: purpose, joy, simplicity, and service. The Loeckens knew they were not just called to live their dream, but to encourage others to do the same through their Passion to Action ministry. Their mission is to inspire others, empower them with tools and resources, and mobilize them to put their faith into action. While reading their story, including excerpts from their children (Ben, Bekah, Abigail, and Noah), readers will witness remarkable courage and see how far God can lead us to places we never imagined. Their book includes ten challenges for readers to complete on their own, such as identifying their passion, conquering fears, and helping someone who is different than them.